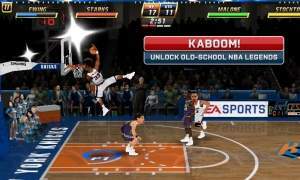 Google Play Year End Sale: Get NBA Jam for 85% off for a limited time only! BOOMSHAKALAKA!Jam with your favorite stars from all 30 NBA teams in over-the-top, high-flying, 2-on-2 arcade basketball just like you remember it – and like you’ve never seen before! Olá @lucas.freire obrigado pela promoção! tenho esse jogo p iphone! é mt engraçado e bem bom de se jogar!